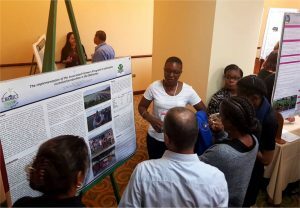 Michele Singh, Country Representative to Bahamas was part of the Bahamas Agriculture and Marine Science Institute (BAMSI) contingent that participated in the 53rd Annual Caribbean Food Crops Society (CFCS) Meeting in Puerto Rico. 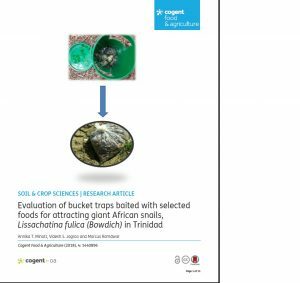 The BAMSI/CARDI group of researchers, presented on recent developments that have been aimed at strengthening the country’s agricultural sector. By treating nutritional deficiencies in sheep, the Institute reported an increase in the overall health of ewes, the herd and neonatal survival rates. The livestock unit at BAMSI serves as the country’s hub for research, breeding and development. Other presentations focused on the crop management for bananas post disaster and the implementation of the Associated Farmers Program (AFP). The AFP targets qualified farmers to locally produce crops with the goal of reducing the high food import bill. Through the AFP the availability of local produce has been increased in Andros and Nassau. CARDI which opened it’s office in 2016 in the Bahamas provides technical assistance to BAMSI. The CFCS was held from 16 to 22 July, in Puerto Rico under the theme “The Role of the Caribbean as a Research Hub to Advance Global Agriculture and Food Security”.